Vasilis Spanoulis renews with Olympiacos. Spanoulis renewed his contract for two more years, until 2018, when he will complete eight years with the Greek champions. 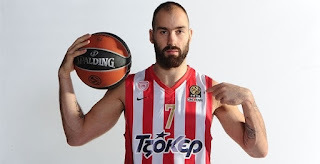 In the last six years with Olympiacos Spanoulis has won two Euroleague Championships, two Euroleague Final Four MVP titles, three Greek Championships and one Greek Cup.